What inspired you to write Starfish? 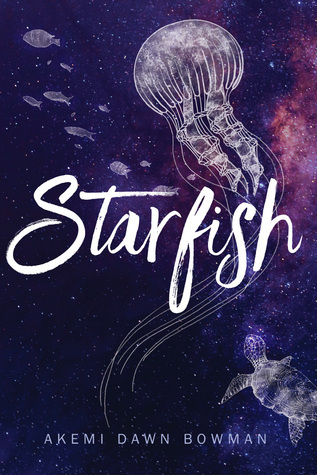 I often hear writers talk about “the book of their heart,” or “the book they needed when they were younger.” And I know it might be a cliché, but STARFISH is very much the book I wished I had growing up. How would you describe Starfish in five words? Can you do a brief introduction of your two main characters? Kiko Himura is a half-Japanese teen who is trying to get into her dream art school. She has a mother who shows very little interest in her, and social anxiety which often prevents her from saying exactly what she’s thinking. Jamie Merrick is her childhood best friend, who in some ways is the extrovert to her introvert. They reconnect just when Kiko’s life seems to be unravelling, and decide to take a road trip together. What Harry Potter houses do your characters belong to? I think Kiko is a Ravenclaw (HOUSE PRIDE! ), although I could see her being sorted into Gryffindor and being completely surprised by it. Jamie is a Gryffindor through and through. Hiroshi is most likely a Hufflepuff. And Kiko’s mom would’ve been sorted into Slytherin, but she’d spend the rest of her life telling people she was in Gryffindor. Which, when I think about it, is a very Slytherin thing to do. What’s your favorite relationship in Starfish (besides the romance)? Ooh, good question! I could go a few different ways here, but ultimately my favorite relationship in STARFISH is the one Kiko has with her art. Her drawings and paintings are not only a huge part of who she is, but they’re also how she expresses all of the feelings she can never seem to find the right words for. Kiko’s passion for art motivates her to chase after her dreams even when her anxiety tries to hold her back, and I think this makes the relationship with her art more important than any side character or love interest. If you could write a letter to any fictional character, who would you write to and what would you say? I not-so-secretly wish I could be best friends with Nina Zenik from Leigh Bardugo’s SIX OF CROWS. She’s hilarious, and she likes food, and honestly the best friends in the world are the ones you can laugh with and also don’t judge you for getting the crème brulee AND the cheesecake. So I’d probably write her the ultimate fangirl letter and ask if she wanted to go out for waffles. Hopefully she’d say yes. Did your time in the Navy or overseas impact Starfish at all? What diverse reads are you looking forward to in 2017? SO MANY. I can’t wait to read Sandhya Menon’s WHEN DIMPLE MET RISHI and Cindy Pon’s WANT. I’m also looking forward to Julie C. Dao’s FOREST OF A THOUSAND LANTERNS, which sounds like the perfect East Asian-inspired fantasy I’ve been dying for! Akemi Dawn Bowman is a writer of young adult fiction. She’s a proud Ravenclaw and Star Wars enthusiast, who served in the US Navy for five years and has a BA in social sciences from UNLV. Originally from Las Vegas, she currently lives in England with her husband, two children, and their Pekingese mix. Her novel Starfish will be published in Fall 2017 with Simon Pulse, with a second untitled project to follow in Fall 2018. She is represented by Penny Moore of Empire Literary. Thanks so much to Akemi for doing this post! I’m so excited for Starfish and hope that it’ll be a book I can really relate to. Be sure to follow Akemi on social media to keep up with all things Starfish related and enter into the giveaway above! The next author up will be Heather Kaczynski.